Killing and selling of the girls was totally banned. Child marriage was prohibited. The minimum age fixed for marriage was 16 years for girls and 18 years for boys. Re-marriage of the widows was allowed. Inter-caste marriages amongst the Namdhari Sikhs were allowed. Castration of the bulls was prohibited. and look after the welfare of the animals. Service to the poor and the needy ones was made a sacred duty of all the Namdhari Sikhs. Till the time of Satguru Ram Singh Ji, the practice of blessing the women with Amrit was non-existent. Satguru Ram Singh Ji therefore decided to bless the women with Amrit and thus gave them parity with men. Innumerable women tasted the pure nectar, and joined the main stream of Sikh religion. They put off their ornaments, gaudily life and started wearing simple clothes. To follow the religious tenets by women was made as much essential as it was for the men. A wooden pavilion (Vedi) was erected at the site of marriage ceremony. 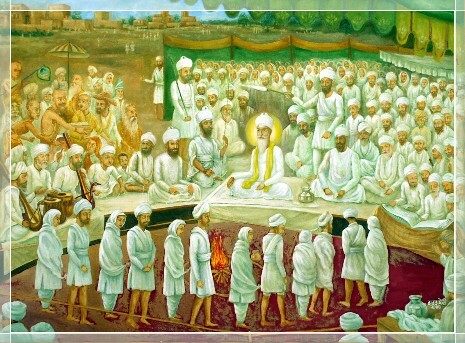 The Havan Vag was performed in the centre of the pavilion, not by Brahamins or Pandits but by Gursikhs; by reciting the Gurbani of Sri Adi Granth Sahib and Sri Dasam Granth Sahib. The girl as well as the boy were then blessed with Amrit and Guru Mantar. The Lavans (Mantras) were recited from the sacred Sri Adi Granth Sahib Ji - four anti-clock wise circles were performed by the couple around the sacred fire of the Havan, inside the pavillion. Covering of the bridegroom's face with garlands and of the bride with scarf (chunni) were forbidden. Thus under the above system, the first marriage ceremony of six couples got solemnised in the presence of Sri Satguru Ram Singh Ji in a big congregation at village Khotey on 3th of June, 1863. Soon after the introduction of the new marriage system complaint was lodged by the Brahmins and the anti-Sikh elements of the time in the society, branding it to be anti- people and againts the prevalent tenets of Hindu religion. The British Government took it that the Namdhari Sikh movement was not merely religious in nature but it was turning out to be political againts the British Government, Satguru Ram Singh Ji was, therefore escorted to Sri Bhaini Sahib under police guard. On 3th June 1863, Satguru Ram Singh Ji set up the new tradition of marriage ceremony amongst the Sikhs. Village Khotey on 4th of June, 1863 - Six couples' marriages were solemnised under the new marriage system iniatiated by Satguru Ram Singh Ji.